Tele-TV – 2002 | JONAH BRUCKER-COHEN, PH.D. Tele-TV – 2002 – JONAH BRUCKER-COHEN, PH.D.
Streaming video through a vintage TV. Today’s streaming video interfaces require multiple players, plug-ins, and usually sacrifice quality for size of the video. 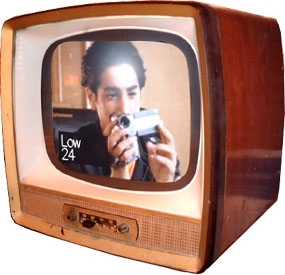 Tele-TV combines live television streamed over the Internet with the simple controls of a vintage television set. Tele-TV is a joint project with Stefan Agamanolis. The project is written in Isis, a programming language he developed at the MIT Media Lab. 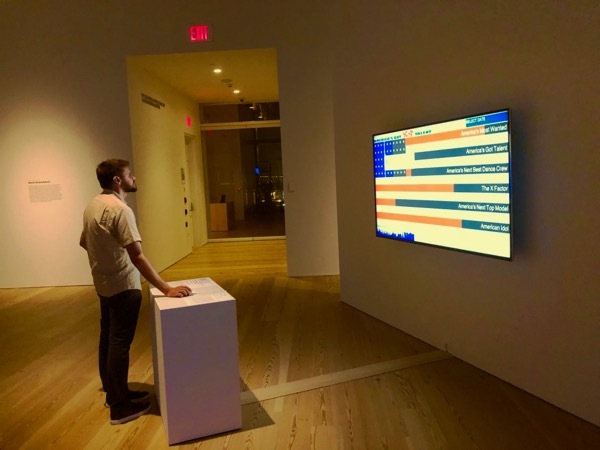 By reconfiguring a vintage television set, the project attempts to combine Internet capabilities with already familiar interfaces. Through three simple knobs, users can choose up to 100 channels of streamed US broadcast television, adjust volume controls, and move a slider to select the framerate and the video quality of the incoming source. The system is a physical installation made a 1960s vintage TV, custom built cicuitry including a PIC, an optical encoder for channel selection, and two potentiomenters – one slide and one rotary – for volume and quality selection. A flat panel monitor is mounted to the inside of the television and is masked with a rounded rectangle to make it fit in the TV display. Tele-TV has a serial connection to the computer which feeds the control data back to the software.